Dear Sinead and Mark,- January 13th, 2013, Feast of the Baptism of the Lord. SOUL FOOD FOR YOUNG ADULTS: Letter to Sinead and Mark- two young adults. 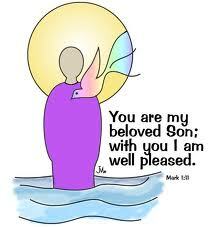 Readings for this Sunday, January 13 2013, are from the Feast of the Baptism of the Lord, Year C; Isaiah 40:1-5, 9-11. St. Paul’s Letter to Titus, 2:11-14, and 3:4-7. Gospel, St. Luke 3:15-16, 21-22. Do you ever feel that your heart is somehow gone ‘dry’, that the fizz has gone out of you? You feel somehow drained, with little heart for life. And then you think back to someone who once put new heart into you,- maybe a teacher, or a relative, maybe someone in your local community who gave you back a belief in yourself and a zest for life? And when you think about that person, you get new heart and purpose again, you’ve got that ‘Get up and Go’ in you, once more. Well, I wonder what was going on in the man Jesus, that time when he approached John and asked to be baptized? Was he searching, unsure of the path ahead? Was he a bit ‘out of steam’? Then, that moment of his baptism, that moment when he was submerged in the water of the Jordan, then came up and went off to pray a while,- that was the moment when he powerfully experienced his whole human self as filled with, as steeped in, the very Heart of God, the Holy Spirit of God. He heard those words: ‘YOU ARE MY SON, THE BELOVED: MY FAVOUR RESTS ON YOU.’ He felt it in his very bones, that he was BELOVED,-and that he had a work to do. This was his ‘Get up and Go’ moment! And maybe, for ourselves, in some moment of quiet, in some place, -any place!- the word breaks through unexpectedly, and we are ‘steeped’ in the presence of the Spirit of God who reminds us who we are,- ‘YOU are my son/my daughter, the Beloved! My favour rests on YOU!’ It all becomes really personal, and we know it in our bones. And if it hasn’t happened to you yet,- no panic. Just make sure that you keep on having little moments of quietness, of quiet still prayer, where you are open to God’s Spirit coming and breaking through,- when you know that, YES!- I am beloved. I am God’s child, God’s loved one. Yes, I am precious,- and God’s favour rests on me as a pure gift. That’s the ‘Get up and Go’ moment, for you. You’ve work to do, you’ve people to love, a world to change. And gradually, you are more and more ‘steeped’ in the Spirit of Jesus, and you have the fire in your belly that He has. It’s a moment to pray for, an experience to pray for. And, if you do, it will come, without a doubt. Blessings of God on you, near and far! Be Loved! ← SOUL-FOOD FOR THE HUNGRY ADULT: JANUARY 13, 2013, FEAST OF THE BAPTISM OF THE LORD.